Today in Masonic History William Frederick "Buffalo Bill" Cody is born in 1846. 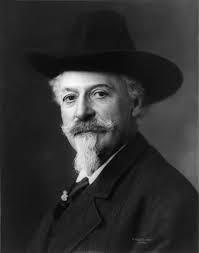 William Frederick "Buffalo Bill" Cody was an American frontiersman and entertainer. Cody was born just outside of Le Claire, Iowa. At the age of 7 Cody's family moved to the Kansas territory. At the time in the territory the issue of slavery was constantly being argued. Cody's father was firmly on the anti-slavery side. One night Cody's father gave a speech against slavery and a member of the crowd jumped up and stabbed him twice, this would contribute to Cody's father death by the time Cody was 11. At the age of 11, Cody took a job with a freight carrier as a "boy extra". It was his job to ride up and down the wagon train delivering messages. In 1860, at the age of 14, Cody headed west in search of gold. On his way west he met an agent of the pony express and got a job with them. At first building corrals and fences and eventually as a rider. Cody served during the American Civil War, although his first attempt to enlist was rejected because he was too young. After the Civil War, from 1868 to 1872, Cody was employed as scout for the United States Army. He performed scouting duties and would hunt bison to provide meat for the Army and for the Kansas Pacific Railroad. It was this job that earned him the nickname "Buffalo Bill". Starting in 1872, Cody went to Chicago and started appearing in a wild west show. By 1883 Cody would found Buffalo Bill's Wild West. The shows were circus like and performed annually. The show would appear in Europe and throughout the United States. In 1893, Cody would change the name of the show to Buffalo Bill's Wild West and Congress of Rough Riders of the World. In the show were people of a variety of cultures including Native Americans Mongols, Turks, Arabs and Gaucho's. In 1895, before taking his show to Europe for the last time, Cody was instrumental in founding Cody, Wyoming. Although Cody referred to himself as an "Indian Fighter" he had great respect for the native American people. He was referred to native American's as "the former foe, present friend, the American" and "Every Indian Outbreak that I have ever known has resulted from broken promises and broken treaties by the government." Cody also believed in the rights of women saying, ""What we want to do is give women even more liberty than they have. Let them do any kind of work they see fit, and if they do it as well as men, give them the same pay." Cody died of kidney failure in 1917. The day of his death he was baptized into the Catholic Church. He was given a full masonic funeral. Cody was an active mason. He was initiated into Platte valley Lodge No. 32, North Platte, Nebraska March 5, 1870 and was raised a month later on April 2nd, 1870. He was a member of the York Rite, becoming a Knight Templar in 1889. He became a 32nd degree member of Scottish Rite in 1894.